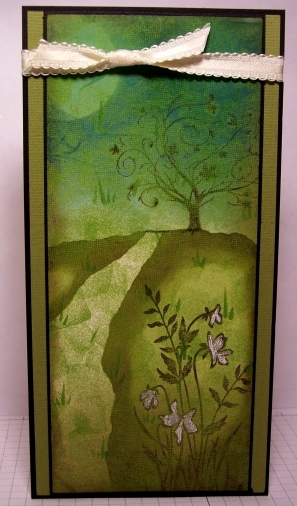 I tried to CASE The Path Tutorial #483 by Michelle Zindorf. Her card was created using Stampin' Up! Well Worn Designer Series Paper, item number 122359. I didn't have any of that dsp so I just grabbed a scrap I had laying around. Where Michelle's card used shades of browns, for my card (since my base paper was a green with a grass pattern) I chose to use Always Artichoke and Old Olive, Pool Party, Marina Mist and Island Indigo with Early Espresso. I LOVE just about everything Michelle does so for me to attempt her tutorials is quite high praise and flattering to her. Thanks Michelle for the inspiration.